Bog woodland is a rare woodland and bog habitat that has priority conservation status under the EU Habitats Directive (Habitat 91D0*). This unique habitat is generally identified by stands of birch trees (Betula pubescens) with extensive Sphagnum and pleurocarpous moss carpets on the woodland floor. The water table is close to the surface of the woodland floor creating swampy flushed conditions. Bog woodland habitat on All Saints Bog, Co. Offaly. The canopy is formed from birch trees and the dwarf shrub layer is rich in Ling Heather and Crowberry. The carpets of Sphagnum moss and other mosses are also present and bright green in colour. Photo: © P. Foss. The term bog woodland is used loosely to describe other areas of woodland occurring on peatlands in wet or dry conditions. For example, on cutaway and cutover bogs and within sessile oak woodlands, in association with nutrient poor flushes (NPWS, 2013). These woodlands types are considered secondary woodlands and are not true bog woodlands according to the European Union Interpretation Manual 2013 of the Habitats Directive. Today bog woodlands are present as a localised habitat in the midlands, within the drumlin belt of the north midlands and in upland valleys (NPWS, 2013). IPCC’s Peatland Conservation Action Plan 2020 lists those sites containing bog woodland habitat. At present there are 23 sites containing this priority habitat across the island of Ireland. Cross, 2002 estimates that there is less than 200ha of bog woodland in Ireland. The largest bog woodland is present on All Saint’s Bog, Co. Offlay and covers an area of 14.34ha of the raised bog habitat. The trees in bog woodlands form a light canopy of 6 to 8 meters in height. Despite the association with flushes, which allow for small amounts of water flow supplying nutrients to the trees, the trees tend to have sluggish growth, with larger trees often suffering from fungal attacks (Cross, 2002). Bog woodlands are dominated by downy birch (Betula pubescens) with some silver birch (B. pendula) and willows (Salix species). Scots pine (Pinus sylvestris) may be present locally. 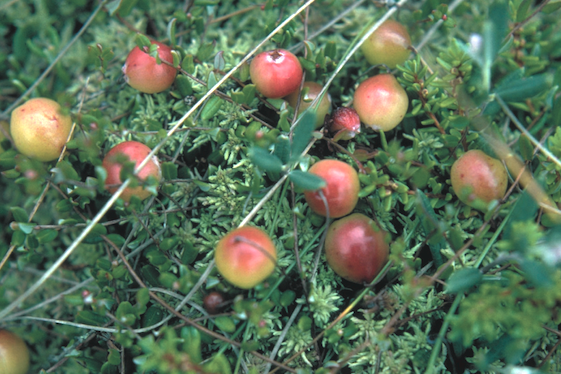 Cranberry (Vaccinium oxycoccus) thrives in the flushed conditions on the bog woodland floor. Photo: © P. Foss. Dwarf shrub, herb and moss layers are well developed in bog woodlands. Ericoid shrubs such as ling heather (Calluna vulgaris) and crowberry (Empetrum nigrum) occur in the dwarf shrub layer. The plants occurring in the herb layer is highly dependent on hydrology with wet and drier areas supporting different species. Purple moor-grass (Molinia caerulea), cotton grasses (Eriophorum vaginatum and E. angustifolium), bottle sedge (Carex rostrata) and soft rush (Juncus effusus) are often found in the wetter areas. In flushed conditions abundant cranberry (Vaccinium oxycoccus) is typical. Whilst bent grass (Agrostis canina), ferns such as buckler ferns (such as Dryopteris dilatata) and bracken (Pteridium) are seen in the drier areas. The extensive ground cover of Sphagnum moss creates a vibrant green-yellow carpet and is a unique feature of these woodlands which makes it difficult to walk in them (Cross, 2002). In addition to the Sphagnum carpet, pleurocarpous mosses such as Pleurozium schreberi, Pseudoscleropdium purum, Hylocomnium splendens, Thuidium tamariscinum form hummocks up to 1m high. The trees are covered in a rich layer of epiphytic lichens. Bog woodlands provide additional habitats, supporting a high level of biodiversity in bogs where they occur. In what is a typically open landscape, the woodlands provide height and shelter habitats for a variety of plants and animals (Cross, 2002). The trees are a shelter and food source for invertebrates and provide cover for birds to breed in. 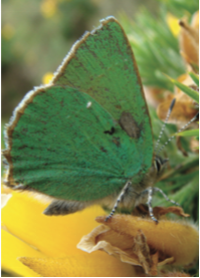 During the summer, green hairstreak butterflies (Callophyrs rubi) (see image left) have been observed amongst the trees, whilst the rare fly (Dictenidia bimaculata) has been found in rotting wood of the Clara and All Saint’s Bog woodlands. This fly is part of the ancient forest fauna of Europe, suggesting that these woodlands have been in existence for a long time, however this is disputed as evidence suggests the woodlands formed in the last 150 years (Cross, 2002 and Cross and Lynn, 2013). 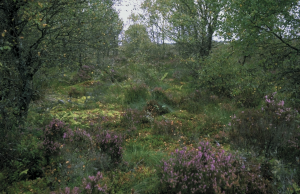 As a designated habitat, the National Parks and Wildlife Service are required to report on the status of the special area of conservation sites designated for bog woodlands every 7 years, these studies include all three subtypes of bog woodlands. The overall conservation status has changed from poor in 2007, to favourable in 2013. This is due to an improved understanding of the dynamics of bog woodlands and the expectation that stands will expand due to colonisation of cutaway and cutover bogs or in response to hydrological restoration (NPWS, 2013). The removal of conifers and restoration works on raised bogs undertaken by Coillte with European Union LIFE funding, may also encourage bog woodland habitat to develop in suitable conditions in cutover areas for example Killyconny Bog in Co. Cavan. 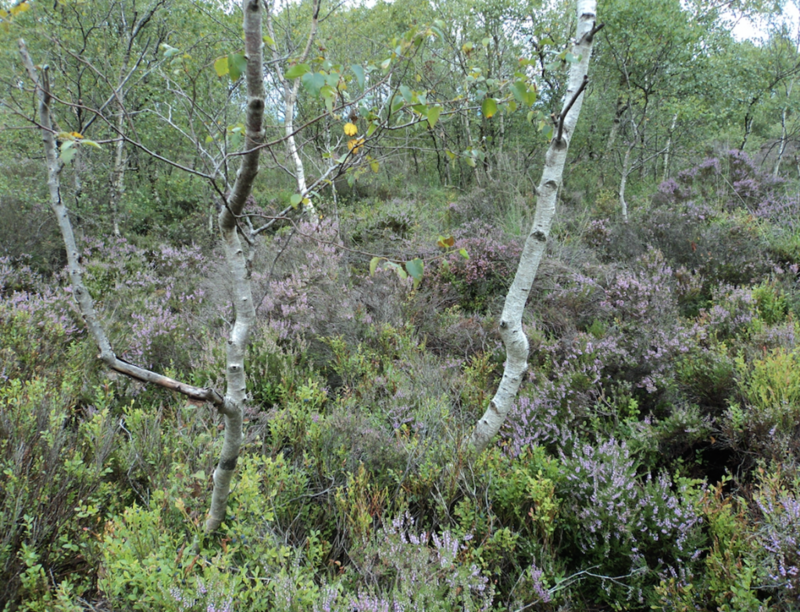 The permanence of bog woodlands is still poorly understood, a broad understanding is that stands on raised bog and within oak woodlands are likely to be permanent whilst those on cutaway bogs are transient communities which may develop into raised bog communities or dry birch woodlands (Cross and Lynn, 2013). Bog woodlands, particularly on raised bogs are one of the rarest peatland habitats in Ireland and Europe. Aware of the importance of bog woodlands, the IPCC conducted a study of a 5ha bog woodland present on Lodge Bog and found it to have strong conservation value. Conservation of bog woodland habitat faces the same threats as other bogs do such as peat cutting, drainage, burning, afforestation and overgrazing. Whilst the conservation of bogs as a whole will aid the protection of bog woodlands they should be recognised for their importance in bog management plans to ensure that they don’t decline further. Cross, J. & Lynn, D. (2013) Results of a monitoring survey of bog woodland. Irish Wildlife Manuals, No. 69. National Parks and Wildlife Service, Department of Arts, Heritage and the Gaeltacht, Dublin, Ireland. Malone, S. and O’Connell, C. A., (2009) Ireland’s Peatland Conservation Action Plan 2020, Halting the loss of peatland biodiversity, IPCC, Kildare. Text prepared by Kirsty Paterson, Photographs and Images © Irish Peatland Conservation Council, Bog of Allen Nature Centre, Lullymore, Rathangan, Co. Kildare R51 V293. Email: bogs@ipcc.ie; Tel: +353-45-860133.